Construction throughout the Aquarium is continuing right along on schedule. 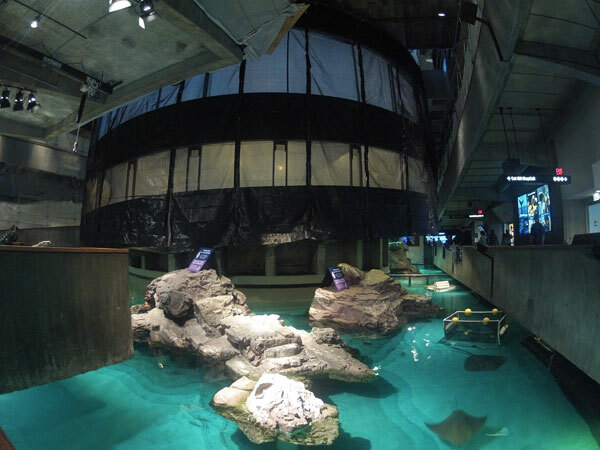 Behind the screen, the Giant Ocean Tank is empty while crews are cleaning and preparing the tank for window removal. This is an exciting step. The new windows will let visitors see the reef in sparkling detail, and many of the new windows will be even bigger than ever! Learn more about the improvements being made to the exhibit during construction. 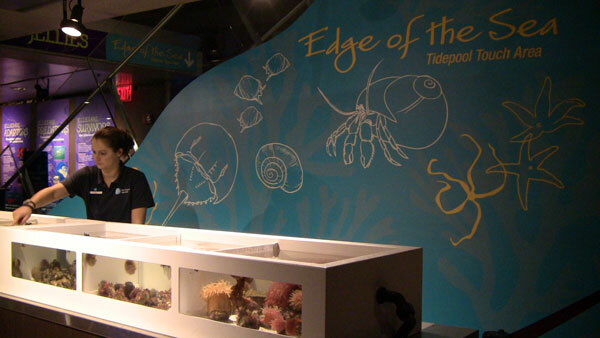 The Edge of the Sea touch tanks have been temporarily relocated to the Ground Floor of the West Wing, near the Jellies Exhibit. 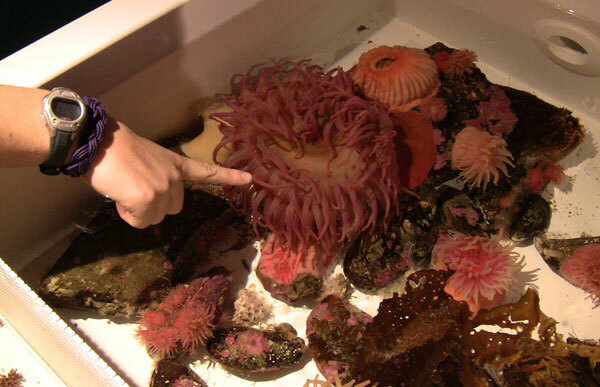 Visitors will still have an opportunity get close-up looks at amazing ocean animals like sea stars and hermit. They can even dip their hands into the chilly water to touch the animals in this hands-on exhibit! 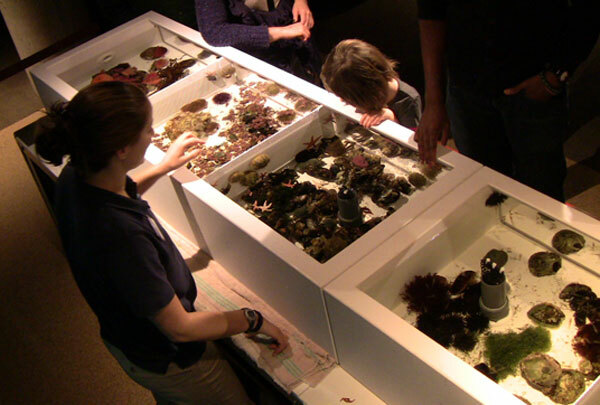 Meanwhile, crews are working on the ceiling of old tidepool touch tank area so they can expand the presentation spaces at the top of the Giant Ocean Tank upstairs. This popular hands-on exhibit will return to its usual spot as soon as construction is over. In its new spot, there are several new species of animals to see and feel, including a new species of urchin, sea cucumbers, grass shrimp and corals. That's in addition to popular animals like hermit crabs, periwinkles, horseshoe crabs and sea stars. Meanwhile, there are more than 800 animals still on exhibit throughout the building! Take our new zebra shark for example, a gorgeous addition to the Tropical Oceans Exhibit. Have you seen Flaherty recently? He's filled out quite a bit, some might say he's a little chunky these days. Get to know 10 special animals we're shining the spotlight on this winter—like the goliath grouper, mandarinfish and weedy seadragon. And of course, don't forget dear old Myrtle. Do you have an idea of when the renovations will be complete? The renovations will be complete by early next summer! Hope you'll come by to check out the new Aquarium experience then, it's going to be fantastic. 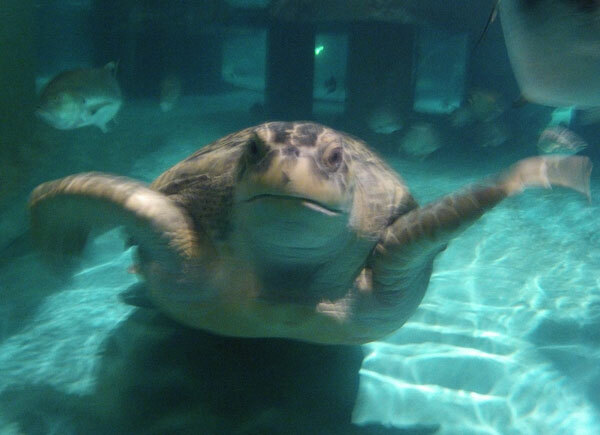 In the meantime, you can still visit many of your favorite animals at the Aquarium like Myrtle, the sharks and rays in the touch tank, the octopus, jellies, little blue penguins and sea lions! Members can use this form to sign up for the exclusive SeaMail e-newsletter. Introducing Member of the Week! First winners!